trent, 28 Jul 2012same thing once again. Your conclusion always remains diplomatic. When you are comparing four ... moreIt's obvious judging by the overall results of the tests (and in the conclusion part) which phone is the winner. Gsma is just being too modest to declare the s3 as the winner, and doesn't want to give the slap on the face to the htc fans out here. AnonD-64641, 28 Jul 2012Htc onex is the best..I do not agree, sold it, too many problems maybe due to tegra 3,...not optimized at all! Now s3, with latest update is perfect,also beats beats audio, camera finally happy, no problem with home pages, touchwiz, widgets,....everything works as it has to! Of course htc is loosing points in the market!same problems with one s that I still have and that will be sent foe the 3rd time to assistence! AnonD-64680, 28 Jul 2012I work for a carrier and the one x does appear to have a lot of faults and gets returned frequently The first batch of the htc x one that had been sold at amazon did indeed suffer from some quality issues and many complaints. I got my one x in a brick and mortar electronic shop some time after the one x got officially released and did have no problems at all. I played a littlbit with the siii in the electronic shop but the one x was much nicer and "sexier" to hold and handle. I am not happy about the lack of sd card slot, but the overall haptic and visual appearance of the one x is second to none. I am just loving it. HTC One X won one of the gpu benchs, you just put the scores out of sequence - it wasn't a clean sweep for the s3 as the article states. I'm the owner of world first dual core phone, LG Optimus 2X, and this is running very poor software, they planned to release ICS for it in Q2 2012, but still no update till now. My suggest is think wisely before buy any of LG phone. same thing once again. Your conclusion always remains diplomatic. When you are comparing four different phones, why are you so afraid of declaring one phone as a winner. Of course we know it all boils down to user's personal preference, but then there is no point in carrying out this comparison. 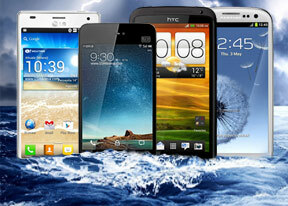 I think you should declare one phone as a winner, whatever you feel as a leading smartphones website. I always feel your flagship smartphones comparison has no proper conclusion. Believe me, its really disappointing. If the LG has had software updates to fix its video problems, then I think I'd buy it if I was to choose between them. so, i vote for Samsung GSIII, since i use video call quite often. s3 is the king for now!and the next konig will be galaxy note 2! Honestly, I would go for the LG Optimus 4X HD. Just wait for Qualcomm S4 pro to crush everything. the bad camera and the overheating. Htc onex is the best..
Pratik, 27 Jul 2012Why not discuss on build quality? s3 recent cracks on back. plastic or so called or looked pol... moreSo how can you protect your ridiculous camera part?